Believe it or not, business cards are as relevant as ever in our digital age. The good news is that you can make your own business cards in minutes using our stunning range of online templates that are quick and easy to customise for exceptional and professional results. Follow our guidelines and we can have your business card printing plus any matching flyers and posters ready for you, fast! 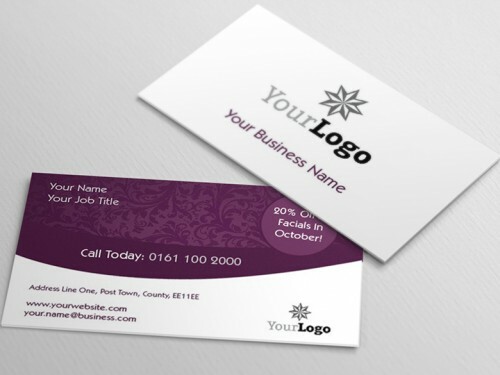 Focus on your branding by choosing from business card templates that allow you to put your logo front and centre. Make sure the design is bold, uncluttered and with an easy to read font. Keep your information easy to digest – contact details and your company website are all you need. Choose a robust card stock that won’t show signs of wear and tear after being carried around in your pocket or wallet. Make sure that your name is the most prominent feature on your card, and design with the recipient in mind. Your card will convey the impression you want to make on people, which should inform your choice of template whether quirky or professional. Add a job title and key skills, a link to your website and social media, and leave the recipient wanting to know and find out more about you. If a personal business card should reflect your personality, a business card for creatives should reflect your artistry, style and creativity. Use an image to show off what you’re capable of, from photography to baking, and don’t be afraid to play with size and layout. Do pick a single font and stick with it. Handwriting style fonts can be difficult to read, while san serif fonts are usually favoured for legibility. Don’t be afraid of leaving white space and don’t you feel you have to cram every inch of your business card templates with information. Less is more. Do make sure that colours contrast – yes to black on yellow, no to blue on red. Don’t play with the the basic hierarchy of business card information which should be tidily grouped and read: name, job title, company, contact information. Do make it easy for people to contact you with clear contact information. Don’t forget to add website and social media URLs – business card icons aren’t clickable!